Sakura shrimp is a deep sea shrimp that measures 4 centimeters in length making it a relatively small sized shrimp that gets its name from the fact that its color resembles sakura cherry blossom tree pedals. There is an annual sakura shrimp festival in Shizuoka prefecture, Japan every May. 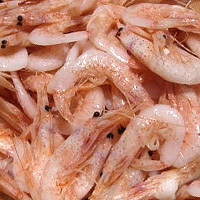 The calories in Sakura Shrimp per 5g(1tbsp) is 16 calories. Sakura Shrimp is calculated to be 312Cal per 100 grams making 80Cal equivalent to 25.64g with 3.25g of mostly protein、0.2g of fat、0.01g of carbohydrates in 5g while being rich in vitamins and minerals such as Copper and Vitamin B12.